So you’ve weighed the pros and cons (there are no cons, just stuff to do to go have fun!) picked an RV, and you’re ready to hit the road, right? Almost…. In between the getting of the RV and the hitting of the road, you need to gear up. Having the ‘right stuff’ will make your camping experience SO MUCH better, but let’s start with the basics. (A link about my gear here). First, you need to get plugged in (see posts about AC versus DC and Shore Power vs Onboard Power (links coming soon!)). For that, you may have a power cord that’s built in to your RV, or you may need to purchase one separately; check with the sales person, the owners manual, or send me the year/make/model of your camper to find out. This connection allows you to bring Shore Power (AC) to your unit, and usually runs all your outlets, Air Conditioner, fridge/freezer, microwave, and other AC powered devices. (A little note about inverters goes here). (A link for power supply protection here). Second, you need a way to get water into your RV. When you connect to a water supply at a campsite (or anywhere else for that matter!) it’s generally called ‘city water’, or just ‘water’. This is used to differentiate between the water supply OUTSIDE your RV versus the water supply INSIDE your RV (The tank and pump (link coming soon!). Usually a quality garden hose that’s marked safe for potable water is fine. I recommend two hoses @ 25′ each so you have a spare, AND can reach faucets farther away. Third, you need a way to get waste OUT of your RV, and that’s where a sewer hose comes in! A sewer hose kit (the hose and all the pieces) is a critical link between your RV and a dump station or site sewer connection, so this is one place you don’t want to skimp out! I recommend two 10′ hose sections, a clear coupler, a clear 90 degree elbow, and a clear 45 degree RV side connector with a hose clean out connection. I recommend clear so you can see what’s going on in there; it helps troubleshoot issues when they come up. There are many things we all agree on in the RV world; camping is fun, camping with friends is better, and it’s important that everyone cleans up their poop (pets and people!). 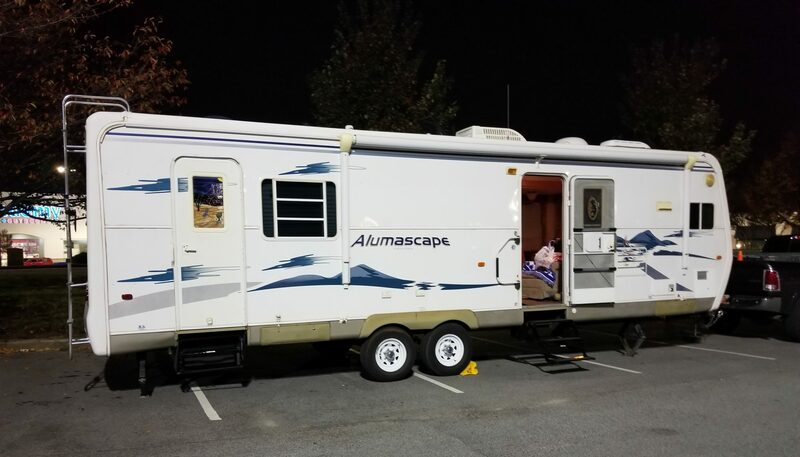 Now, before we get into this, let me clarify this point, we’re simply comparing RV’s that can be driven from one place to another, to RV’s that require a tow vehicle. Inside of those two things there are many more things to consider, but those will be covered in other posts. A motorhome is an RV that has it’s own propulsion system, that is, its own engine, which means it can be driven from one place to another without another vehicle. These come in various sizes, shapes, layouts, and generally fall into one of three classes, which is covered in another post. Motorhomes are easy to get in and drive to where you want to go, so long as you fit where you want to be. The pro is that you don’t have to have a separate vehicle, but the con is that you’ll need to make arrangements for side trips, like groceries, site-seeing, and so on. You can get around that by towing a passenger vehicle, but you’ll lose some of your alreadt not so great gas mileage for that. With a trailer, you can still go places and see things, but I find it nice to drop the trailer and be able to drive around to wherever I want to go from there. You’ll have to have a tow vehicle capable of handling your trailer, but you may already have one and just want to add a trailer that fits into the specs of your current vehicle. Regardless of the mode you choose, you’ll be able to enjoy RV’ing all over the place, it’s just a matter of choosing which way you like better. So many questions, so many buttons, what do I do?!? I know it’s generally ‘easier’ to drop a post on FaceBook and ask ‘how do I?? ?’, but let’s take a few minutes to talk about the importance of paperwork, most notably, the manuals and guides that came with your RV. There’s a lot of useful information in all those manuals, pamphlets, guides, books, and so on that came with your RV. If you didn’t get a big stack of stuff, reach out to the manufacturer and see if you can get copies of all that stuff. any other major components that are separate from the body of the RV. Having that ‘cheat sheet’ on hand makes it easy for you to get going on parts and repairs, but having all the manuals on board and organized will save you lots of time when you’re looking for answers. So anyway, I got all packed up and ready to roll out of LaGrange. I got on the road, and dealt with the usual mix of people driving their phones and playing with their cars, people who don’t know how to merge, people who wait until it’s too late to merge and then cut you off, and one drunk motorcyclist who thought my decals were the coolest mural ever. I get to my destination, I check in at the office, we make some changes to my site assignment, and off I go to set up camp. I got side-to-side level (always do this first!!) on the the third pull-in, without blocks, and was very happy. I set about setting up camp (check out my procedures posts!) and i’m thinking the worst is over. (Ominous music here). I open the back compartment door to get my freshwater hose out and I see not one, not TWO, BUT THREE new ant nests. THREE. IN. MY. COMPARTMENT. Fine, you want war? War it is! I spent 20 minutes with a shop vac sucking those little buggers up, and i’m pretty sure all my neighbors think i’m bonkers now because I was quoting Enders Game the whole time. Damn buggers. Ok, buggers vacuumed, connections made, camp set up, the dog walked, and a bunch of other little things, so now back to finish dumping my black tank (it never got emptied the second time). I turn on the sewer flusher hose, hear nothing. Darn. I leave it on about halfway, open the black tank valve, and watch happily as mostly clean water drains out. Great! All clean, no big deal. I go inside, (I wipe my feet) I check the tank levels, and all three show empty. Awesome! I got outside, I close all three tank valves, and I go on working on the internet connection. I determine it’s a lack of park bandwidth, see that I need groceries, and hear my dog telling me it’s time to go to the park. So off we go, Scout and I, to the park, where she had a great time and I hung out. Then off to get groceries, and finally, back home after three hours. Three hours…. that nagging feeling in the back of my head… three hours… odd. I think I missed something, forgot something. Weird. What happened you ask? Well, i’ll tell ya. I checked the tank levels, and sure enough, black tank? FULL. I mean FULLLLLL to the BRIM, and then some. You may recall I left the sewer flusher on about halfway, and never did turn it off? Yeah, that’s what I forgot. So, lesson learned, don’t leave your sewer flusher on and go away on adventure, because you’ll come back to a pedal activated geyser! So now here I sit, fingers sore from all this typing, brain happy from the wine, floor clean from the towels, tanks clean and empty, and i’m happy to pass this story on to you in the hopes that when you make these mistakes, you’ll laugh about them, too. (Ok Sarah, you can laugh at me now). Part duex… as in doody.. Hahahaha….. hah. Ok, enough of the crappy jokes, back to the story! So, I had just watched the dump station overflow, fought with it awhile, and finally washed it all away with clean water. I packed up my stuff and that’s when I realized I had left behind my splitter and regulator, but I did NOT want to take the rig back through the park (super nice park, but the one main road going through is narrow and twisty all the way through). So, i’m thinking it’s all good, I just need to put my crap away and go on, right? (All together now…) W R O N G.
The ground is now burping up MORE stuff, so i’m battling it with the hose, flooding the area with clean water, and losing. It took five whole minutes to get that under control, and the ground stopped burping; ridiculous. Ok, so, I get the hose under control, I rinse the compartment from a safer distance, I get the ants off of me, I get the wheel chocks put away, and eventually get everything else ready to transport in one way or another. I dry off (ALWAYS keep extra towels in the truck, you never know what life will hand you!) take a few minutes to just breathe, and remind myself, “A bad day of RVing is better than a good day in a house” (I’d like to spray wet, angry ants on the person who came up with that crap!). Today was packed full of adventure (problems) and I reminded myself several times that I really should be blogging more of my adventures, so here we are. I did all the big packing last night, like I always do, so I only had a few key things to pack and put away this morning. I ran some errands, got those done, and proceeded to make ready, bring in the slides, and hookup. I was camping in a park, on the lake (BEAUTIFUL site, AMAZING view!) but it was water and power only, no sewer, so I had to stop by the dump station on my way out, no big deal. Well, it was a big deal (ominous music here). I got to the dump station, got lined up just right the first time (Easy to do, there’s a big concrete strip in asphalt where your dump tube goes!) and hooked up my sewer hose. I pulled the black tank handle (Always dump the black tank first! ), and watched with a silly satisfaction as the liquid quickly filled the hose and whooshed away (sound effect here). That lasted of all 10 seconds, and then, a slow, tiny, brown trickle (I hope you’re not eating while reading this!). Trickle, trickle, drip, drip, nothing. Ok, no problem, just a clogged valve, I can handle this! I quickly cycled the valve gate several times in an effort to dislodge the stoppage, no help. I hooked up the sewer flusher hose (having a built in sewer flusher is AMAZING) and turned it on… no noise, no sound, no flow inside. The downside to doing this solo is that I have no one to tell me what’s going on inside, or to turn valves outside, while I do the other thing, so I have to walk around the RV, go inside, wipe my feet real good (hey, i’m solo, not an animal!) and look/listen for signs of my sewer flush system working. Nothing. No sound, no movement of water under the toilet flap, nada. So I go back outside, disconnect the hose, check the water flow, and it’s flowing fine. Great. Take the elbow connector off, and find crud on the screen washer between the elbow connector and the hose fitting into the RV. Awesome, little screen did it’s job, I clean out the mess, verify the screen is good to go, and put it all back together. Now we have water flowing through the sewer flusher pushing the clog out, right? Walk around the RV, get in, wipe my feet, go into the bathroom, look/listen. Nothing. Nada. Zip. Go back outside, walk around the RV, look at hose connection, scratch head, shrug, turn hose off, move hose to sewer line flusher. Turn on full blast, turn on little connector between hose and sewer connector, and…. psssss….. little tiny spray of water. That little rubber piece inside? All smashed up. Yay. Ok, fine, next idea. Close black tank valve. Connect city water connection. Turn on city water connection, walk around RV, go inside (wipe feet), go into the bathroom, point very bright flashlight down toilet bowl, press pedal to the floor, and watch water swirl into the tank. Hold this position until tank is almost full (doesn’t take long, it was FULL when I started, and only let out a little). Great! Go back outside, open black tank valve, grin as waste goes WHOOOOOOSSHHHH. Awesome. Tank empties, I close valve, go back inside (wipe feet), fill up tank with toilet again. Takes forever, play on facebook and search on indeed while I stand there. Side note, there are no jobs for pedal holder, but plenty of jobs around pushing a pedal. I’m clearly overqualified. Tank is full, go back outside, open valve. Big whoosh, mostly clear, much happy. Hear metal tinkling sound, think, “THat’s not good…”, turn to sewer connector in ground (less connector, more hole at ground level that you drop your elbow connector into) and watch as the ground burps up my connector, shoving it two feet to the side, and then spews… waste. I take a BIG step back, close the black tank valve, and watch as the ‘water’ overflows the concrete drain area and into the grass area around it. It was at this point I took note of the much thicker, greener, taller grass in the middle of the small valley where the runoff was going, and it suddenly dawned on me… Yeah. So, I scratch head some more, text the park manager, and attempt a couple of ways to unclog the drain. All failed, all made more mess, so I simply diluted the water until it was clear around the drain and didn’t stink anymore. I cleaned up my hoses, hung them on the back steps to dry while I drove, and pondered my next move. Whew, we’re over the worst of it now, right? Wrong. So in this series we’re discussing all the things relating to ‘Getting Started’ in RVing, so in this entry, let’s talk about Road Readiness. Road readiness is something you should check your rig for before every trip, and maintain a constant eye on while traveling. Road readiness for you is just as important, but seems to be often overlooked. Whether you add on to your existing policy, or buy a new policy, make sure you have insurance that covers yours needs. Some key things to look for are coverage for damage you might do to other people’s stuff (like backing over something and knocking a pole over), and coverage that insures your rig gets fixed if someone or something damages it. I also recommend coverage dealing with towing, accommodations, and other travel insurance to ensure your trip goes as smooth as it can. This type of insurance generally covers a reasonable cost for out of pocket expenses incurred because you can’t use your RV for a few days while it’s being repaired. Each state may have it’s own licensing requirements based on the Gross Weight of the vehicle, and some have further restrictions based on number of vehicles being towed, types of vehicles, and/or length. Be sure to check with your states regulating office for the details. I also recommend www.dmv.org for lots of useful information for each state. Your insurance policy may include roadside assistance, but it’s prudent to make sure it covers your RV, too. If it does, great! If not, having roadside assistance is something you should definitely have before you call yourself ‘Road Ready’. No matter what kind of rig you have, making sure all your paperwork is in order before you go will help you have a hassle-free trip!